ALL CLASSES: Your mats, weights, towels, water, and props at KMB are always included, at no additional fee. Ask questions and inform your instructor of any pre-existing injuries before class. Intermediates take any class on our schedule. 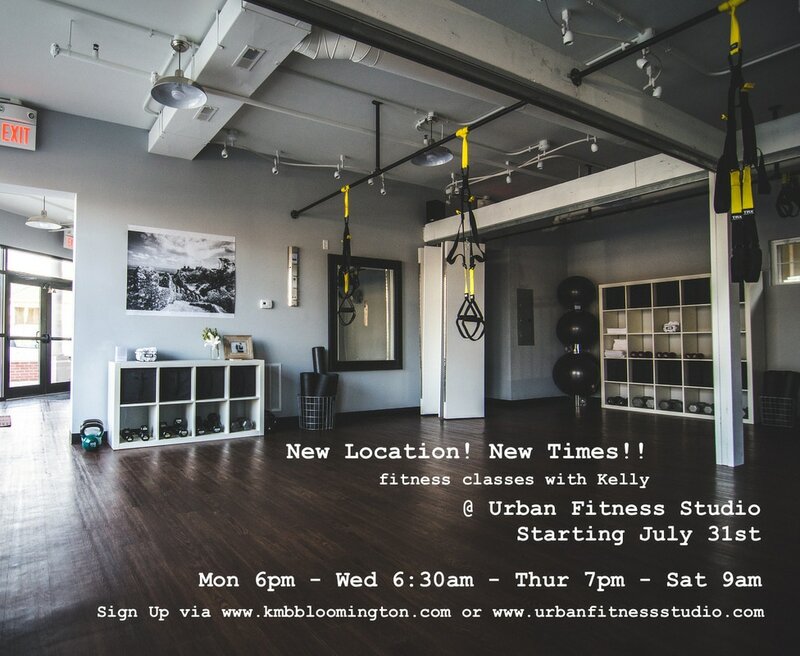 Advanced take any class on our schedule, but especially Mondays' and Saturdays' "UpLIFT" which has extra weight lifting and more challenge variations offered. Background: All KMB Method "barre" classes have been expertly designed and continuously refined over the past six years. The original choreography sometimes utilizes the ballet barre to intensify movements. You will focus on extending endurance phases for core muscles, high repetitions for every muscle group, and quick transitions in and out of periodic cardio sections. These are the most effective and efficient workouts you'll find; the only "stand-alone" formula our founder and clients have tested over time and proven to work quickly but also sustainably. Avoid developing injuries or degrading the body over the years. Stabilize your joints, maintain endurance, balance your body! The format now accommodates almost every season of life and experience level, proving safe, challenging, and fun! This works as a daily dose of exercise for desk workers, but also as an injury-preventing and performance enhancing routine to balance athletes who are in rigorous training. When done properly, this method produces immediate measurable progress. Reduce stress, tighten and tone your entire body, manage weight, build muscle if desired, (with heavy weights and adjusted diet,) avoid injuries, and improve flexibility and posture. ​Learn the basics of proper alignment and technique at a slower pace. Develop and maintain a base-level of fitness before tackling advanced classes. Intermediate/advanced exercisers are also welcome to take Basic Barre to focus on fundamental techniques, and you may add your own challenge preferences known from advanced classes. This class can be modified to fit almost all needs and abilities. Ask questions before class! The choreography is original daily, and sometimes utilizes the ballet barre to intensify movements. You will focus on proper form for the entire hour, improving endurance and strength of core muscles, high repetitions for every muscle group, and quick transitions in and out of periodic cardio intervals. ​Want more positive encouragement? UpLIFT is the same dependable KMB fitness class format, (see barre fitness description,) but includes more heavy lifting, more challenging variations, and features encouraging and uplifting music instead of pop music. Ideal for advanced exercisers who believe we have a responsibility to be good stewards of our bodies, not out of vanity but out of gratitude to our Creator to remain fit and able-bodied. We hope these more intentional soundtracks will lessen the "noise" and negative messages in your day, and will help you stay focused on the good work ahead. UpLIFT, and uplift others!